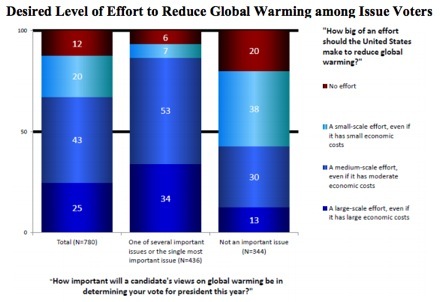 SAGE – Voters Care About Climate, But Will Candidates Notice? Voters Care About Climate, But Will Candidates Notice? That voters don’t care about climate change has long been a political truism. But is it true? Independents are generally in favor of climate action, and resemble Democrats in their climate beliefs much more than they do Republicans. Most voters –– even most Republicans –– favor policies that reduce greenhouse gas emissions, including regulating carbon dioxide as a pollutant, making fossil fuel companies account for their external costs, and enacting a revenue-neutral tax shift that taxes carbon emissions and reduces income tax. Not only do these patterns manifest nationally, they also hold true in ten swing states. Whether the candidates respond to voters’ concerns –– or whether Republicans in particular are too captured by fossil fuel donors to pay heed to the electorate –– remains to be seen. Regardless, it’s a remarkable study, even more so considering that it was conducted in March: before this summer’s devastating drought and wildfires demonstrated that the costs of unchecked climate change will be far more severe than the costs of reducing emissions. The climate is not the president’s — or the government’s — responsibility. Stop worshiping at the alter of the State. They are not gods. They are humans. Very flawed humans who prey on your gullibility. They are lying, scheming politicians. And that was a redundancy if there ever was one..